Ashley here, from Ash Bush Custom Pen Holders! 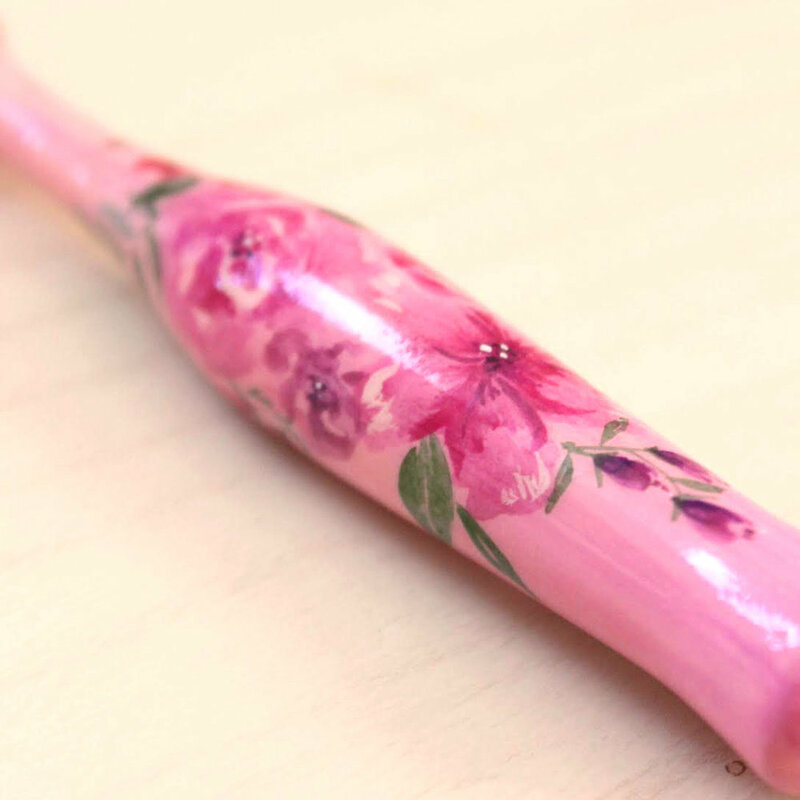 Today I want to share, from behind the scenes, what goes into making our pens – from carving the wood on a lathe, to hand painting and lacquering each one, to custom-fitting flanges on the obliques, and finally, to shipping them to our customers around the world. Our pen-making process has evolved tremendously over the years. When we started, we made simple, natural wood holders, selling them for $20 each. (They were awful.) When I first tried painting a pen, it sat in the shop and never sold. I thought, "Hmm, well I guess people hate it." But there was a far-off vision in my mind that I couldn't quite see, but that I knew I had to keep pursuing. So I continued to paint pens – ones with leaves, flowers, galaxies, and oceans – and slowly people started to see my vision. That vision is still becoming clearer with each passing day, and the process of realizing it has been wild and exhilarating. My goal is to have a shop that's light, bright, creative, and supportive of other makers! I've loved every minute of this venture. 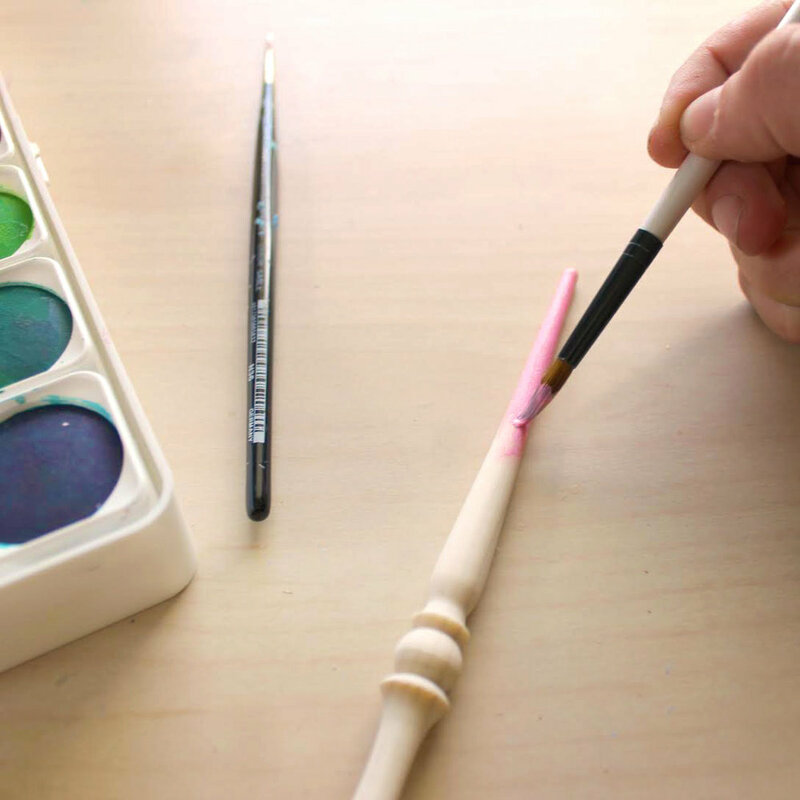 The making of a single pen begins with soft, light-colored woods because they work the best with watercolor and are extremely lightweight. In the workshop, the pen gets carved on the lathe, sanded down, drilled, and slitted. Zach used to carve all the pens by himself, but beyond the first year, as orders began to stack up, he quickly became overwhelmed and overworked. I realized we needed to train some more people to make pens for us. Now we have a team of two people turning pens for me: a local retired wood-worker and my mom! Painting the pens is the most creative part for me. I've experimented with paints, finishes, inks, shimmers, stains, and different processes. After the pen is painted it needs to be sealed to protect it from water and ink damage. I use a clear, glossy lacquer to finish all my pens, and apply 6 coats. After the lacquer is completely dry, I make and install a flange on the oblique pens. Each flange is made to fit each specific pen and can be set to different angles and sizes. Every pen maker follows a different process when making their pens, based on their experience, personal preference, and end goal. My flanges are set to a 60-degree angle, a little less steep than some other pens. It's the angle I prefer, and has ended up being the most preferable for most of my customers, too. The ideal angle for slanted, Copperplate-style hands is anywhere from 52 to 60 degrees. This pen is an oblique, which means that the nib is set to the side at a 52- to 60-degree angle. This is the ideal angle for slanted, Copperplate style hands. At last, after carving, painting, sealing, and flange-fitting, our pen is ready to use! Some may find that oblique pens (such as this one) are a little weird to work with at first, but I usually recommend them for beginners because, once you're used to it, they end up being easier to use than a straight holder. A lot of calligraphers prefer straight holders for modern and upright style calligraphy. Straight holders can be used for the more traditional slanted hands as well, but they require your paper to be angled at a severe 55 degrees, and I find that skews my perspective while writing. The experience of owning an Ash Bush pen starts with the packaging. One of my all-time favorite things is writing the new owner's name on their box! Choosing the right pen comes down to personal preference and figuring out what works best for you. You can read more about choosing a pen in the FAQ's on my website. This is a picture of our Colorful Carrots (left). I have a love affair with carrots. Besides the fact that they're super cute, their shape is made in a specific way that alleviates hand cramps with the wide grip, and garners a lot of control while writing. 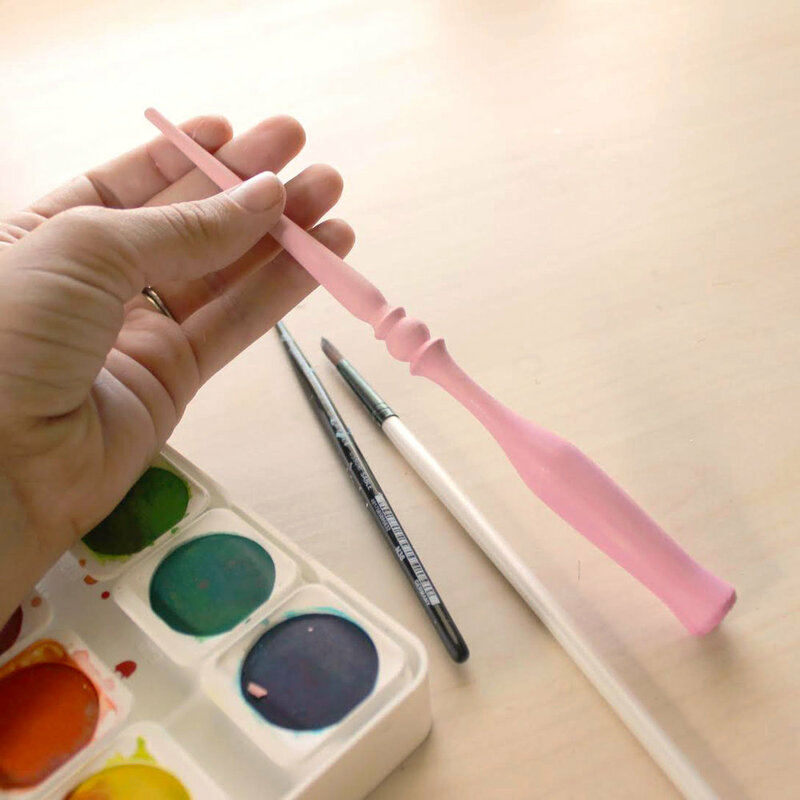 We're now able to offer a wide range of custom pen holders, including Paint-it-Yourself Pens, Colorful Carrots, Design it Yourself Pens, and Fully Customs. 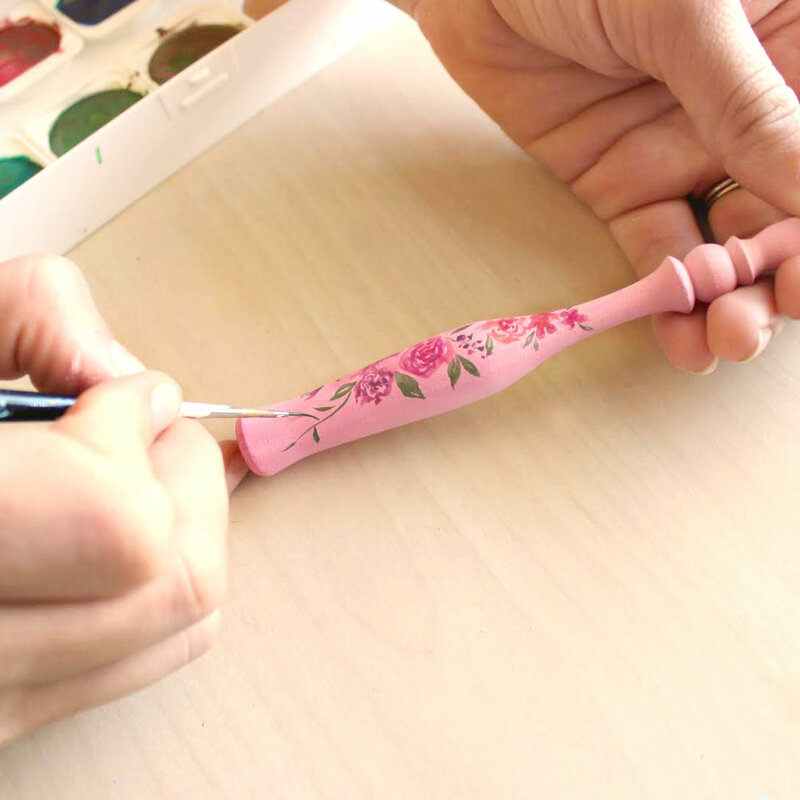 Length – Our default holder length is 8 inches, however sometimes people with smaller hands prefer shorter pens! Shape – We love it when customers send us inspiration images to work with, but we are just as happy to have free range to be creative and design a shape just for you. Type – We need to know if you prefer a straight or oblique pen, and whether you want it to have the thick "carrot" grip. Flange – We offer affixed and non-affixed flanges. Affixed flanges are glued in, giving them more stability. The downside is that they are a bit more difficult to adjust and clean. Non-affixed flanges are interchangeable, so the whole flange, which is held in place by a pin, slides out the bottom of the holder. If you order a pen with a non-affixed flange, it will come with both a large and a small flange, suited to multiple nib sizes. Painted design – Do you want a hand-painted scene? A shimmery ombré? Natural wood? A mix of all 3? Get creative, we love trying new things! Check out #ashbushholders on Instagram to see even more examples of pens I've painted. Follow me for more sneak peeks into my studio, works in progress, and shop announcements! And be sure to check out my Calligrafile interview, here.